The original rear exterior wall separates the living room from the new maple-clad kitchen. Millwork by Kevin Karst. The solarium and stained glass are original. 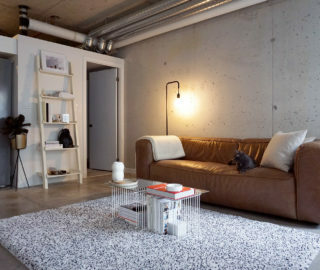 Flooring by Gusco; furniture from Mjölk. 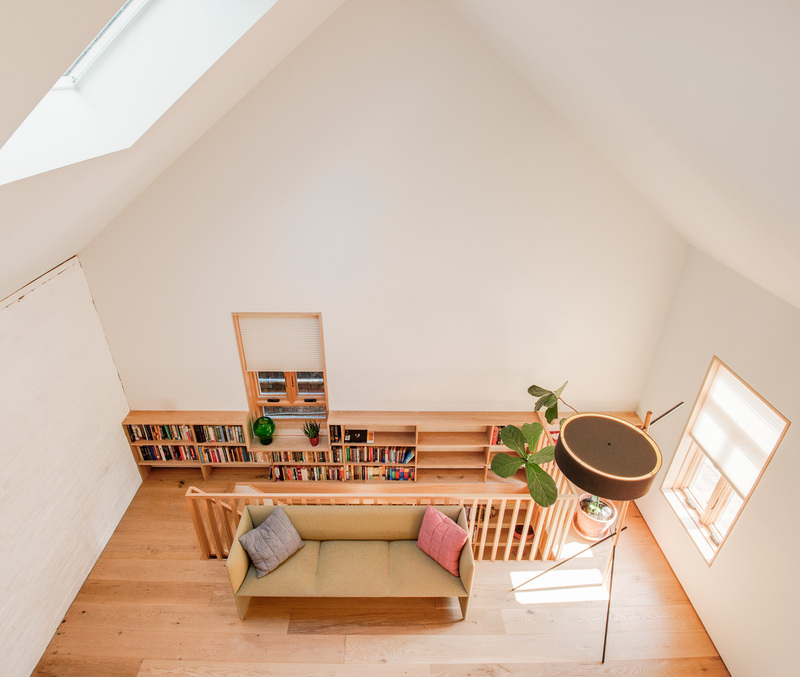 Two bedrooms and a bathroom upstairs are housed in an oak-clad structure. Above will be a lounge accessible by ladder. Sofa from Mjölk; lamp from LightForm. In the master bedroom a metre-wide windowseat overlooks the garden. 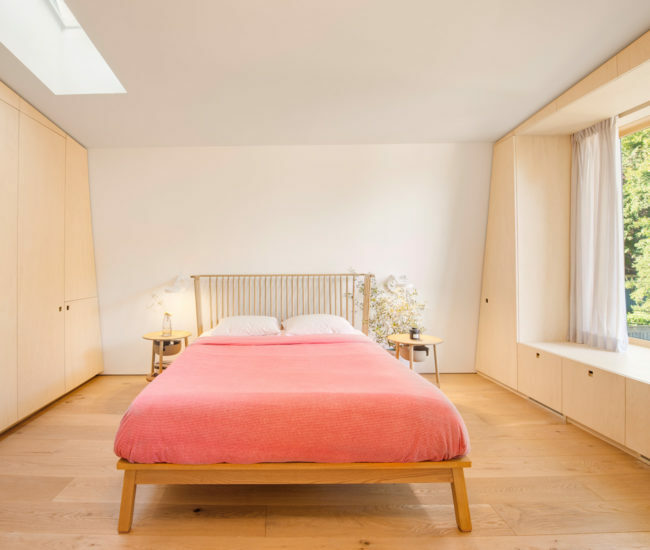 Side tables and Ilse Crawford bedframe from Mjölk. A custom barn door separates sleeping and bathing quarters. 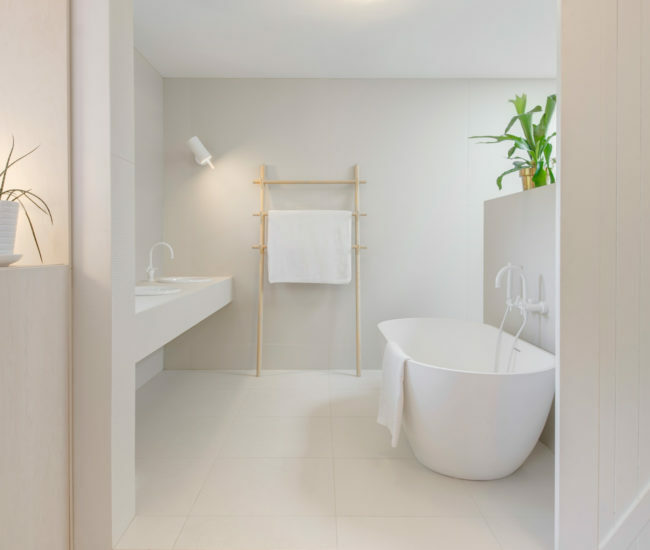 Mutina tiles from Stone Tile; towel rack by MSDS. When they first saw their house in 2013, the homeowners fell in love with its proportions, and its face. They were immediately drawn to the red brick, 1900s bay-and-gable facade, and it was the one thing the couple knew they wanted to keep. 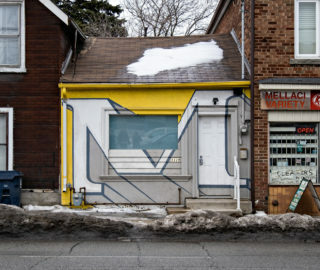 The Parkdale building’s cottage-small, stained-glass front porch belied the larger square footage and the big yard out back. 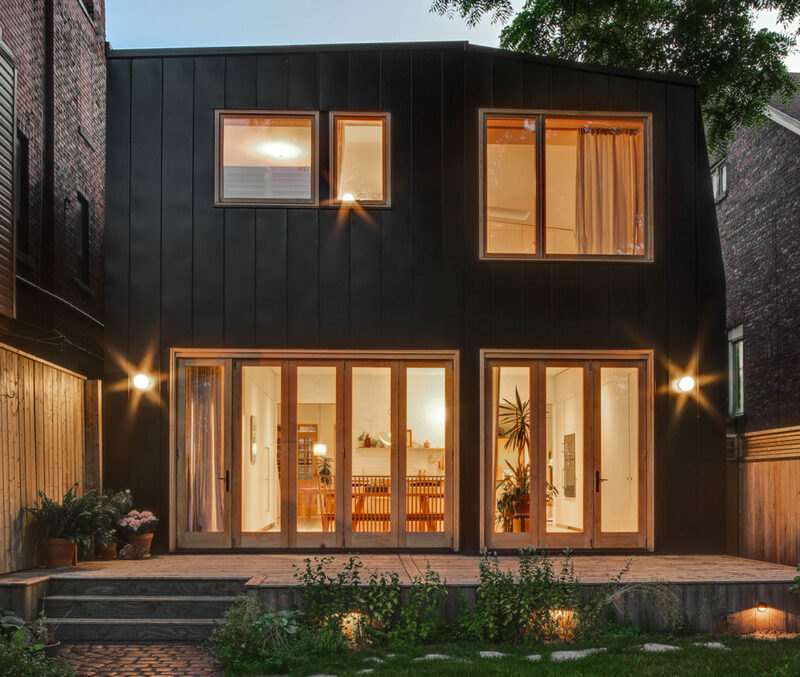 The home’s previous owner had split the building into several apartments, which meant a large reno job ahead. But the couple was undaunted, confident that they could turn it into their dream home. 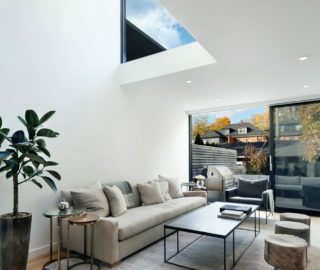 Self-professed design addicts, they trawled the web until they came across a project by brother-sister duo Antoine and Melanie Morris, and their partner David Long from The Practice of Everyday Design, which had transformed a suburban bungalow in Mississauga into a rural, Scandinavian retreat. Its serene interior and quiet facade immediately struck a chord. 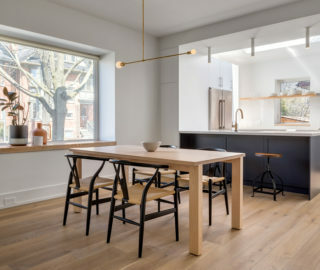 They hired the firm to gut and rebuild their turn-of-the-century house into an elegant, contemporary space with a distinct Nordic feeling. From its nesting-doll bedroom structure on the second floor to the surprisingly spacious ledges that line its windows (each is a reading nook unto itself), the entire home is imbued with hidden volumes that are barely visible both from the outside and in, including a clean-lined back addition clad in matte black aluminum. 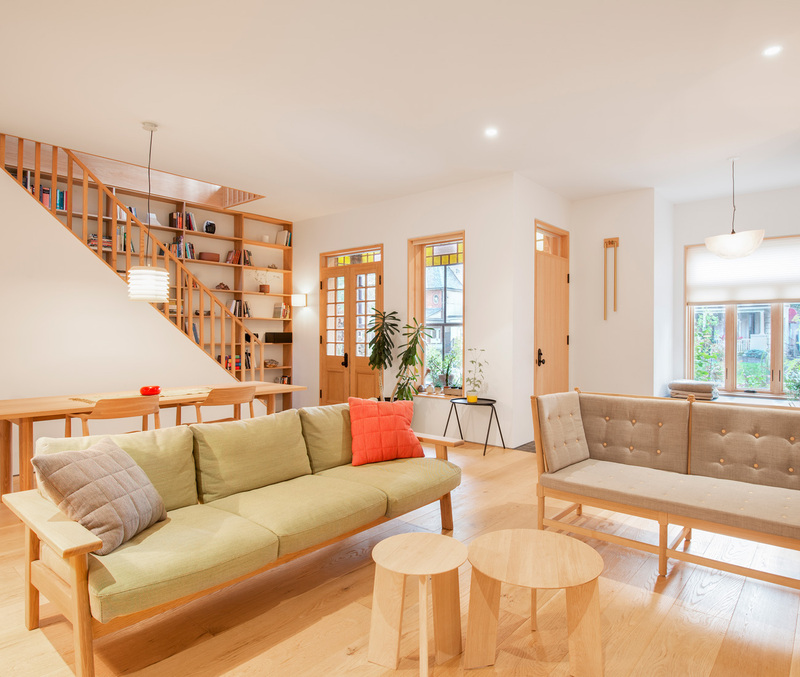 The house-within-a-house structure upstairs was originally meant to work as three rooms with pitched ceilings, but Antoine carved out more space by making the ceilings flat, allowing for a future loft space accessible by a ladder. 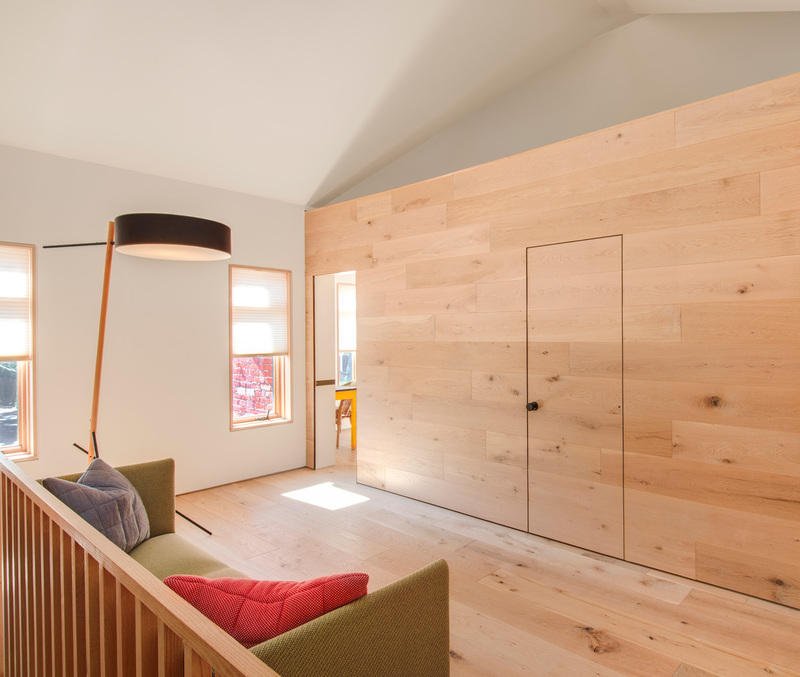 The master bedroom and spa-like bathroom are boldly of equal size, separated by a barn door. On the main floor, three interior walls that had cut the original space into units were knocked down. 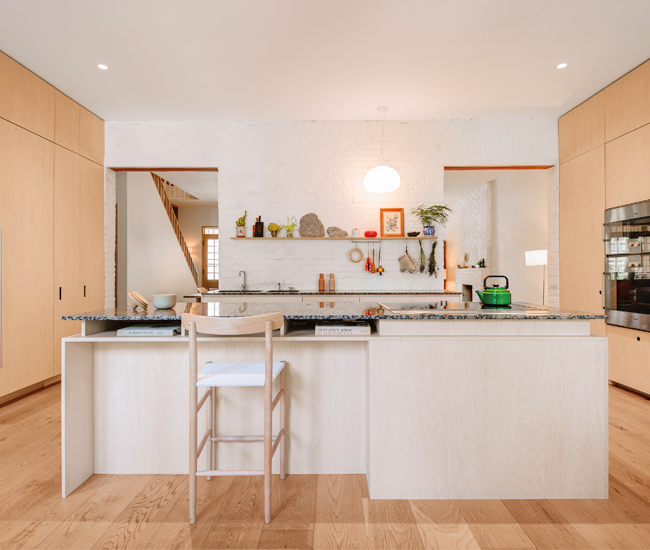 The rear brick wall was left intact with two wide doors cut out of it, barely delineating the kitchen and living room, blurring the lines between the two spaces. “We wanted to keep it monolithic, and try to maximize the area the couple wanted,” says Antoine, who also achieved this visually by keeping most surfaces pale. He conveyed space changes through texture instead, from bleached wood cabinetry to white oak floors and whitewashed brick walls. 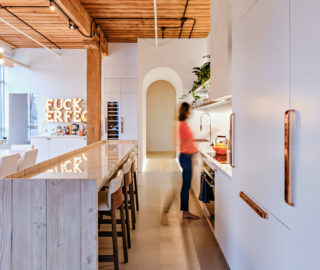 That simplicity also highlights a host of collaboratively designed features with exacting details, and some eccentric touches, too. Electric sockets, for example, are cut straight into the wall-to-wall mirrors of the second-floor bathroom. Millwork in the master bedroom has a cutout to conceal the wire of a lamp. 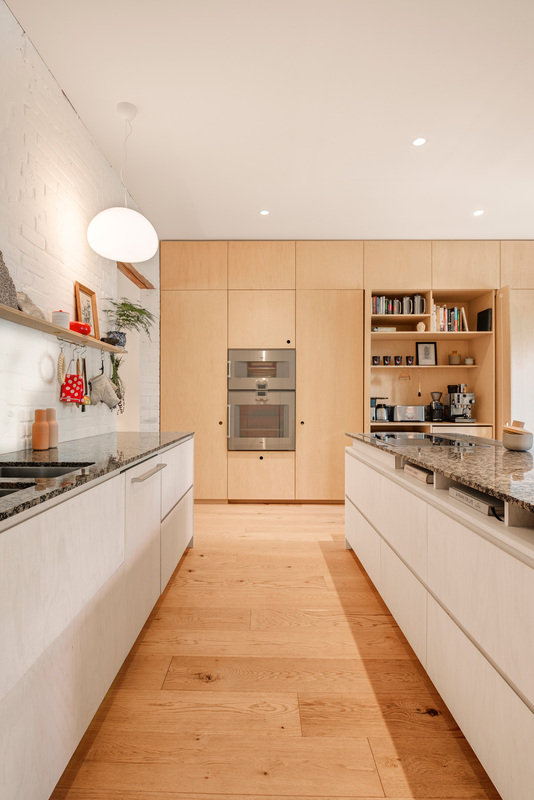 The kitchen’s seamless wall of cabinets was purpose-built for everything inside: the clients mapped out where they wanted each pot and pan to be ahead of time. Antoine also fashioned a set of brass chimes into a truly unique doorbell. A Scandinavian aesthetic pervades throughout, a look passed along from a client’s childhood growing up in a Danish household where low-lying pendant lamps and laid-back sofas were the norm. 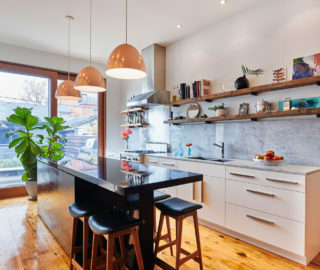 The couple spent nearly eighteen months post-reno slowly acquiring pieces and labouring over the placement of each one, from the Ilse Crawford lamps to the Jasper Morrison benches – slowly giving a personality to the home behind that great face. Originally published in our Winter 2015 issue as Northwest Passage.